The Magic Mill Souvia Sous Vide is one of the more unique and interesting sous vide models we reviewed, there's a lot to like here, but it has a few negative aspects as well. Quality is lower than average compared to other models. Alligator style clamp doesn't offer much vertical adjustment. High power and high flow means faster water loss from evaporation. Weight is heavier than average. $55.99 Current Price - YOU SAVE 15%. The Magic Mill Souvia Sous Vide was a unit we initially liked a lot, however there were some things that did give us some concern during our review. One of the biggest things to be aware of is while this model does offer WiFi Connectivity it's only on the 2.4 GHz band, and most modern routers are on the 5 GHz band. This means you have to create a separate 2.4 GHz WiFi Channel and Connect to that if you want to use the WiFi Functionality. The clip is a tension clip, which felt pretty flimsy compared to all of the other clamp styles. However, it's actually pretty clever, since it rests on the bottom the clip only need to keep the unit from tipping over, it doesn't need to clamp down on the side of the cooking vessel. This model was slightly better than average quality compared to other models. We didn't have any quality issues, however there are a few too many reports of malfunctions from other people to ignore. We'd like to give this model a higher review score but there were just too many people having problems, so know what you're getting yourself into before you choose this model. The Magic Mill Souvia Sous Vide is $55.99 , compared to our second highest rated model the Wancle Sous Vide SVC001 for $87.99 which we feel is a much better value. This model is 14.25" in height which makes this model smaller than the average of all the models we reviewed. it has a standard strength housing and a polycarbonate tube housing for the heating unit. It has an alligator style clamp, which is easy to set-up and cleanup and put away, but it doesn't off a lot of flexibility for vertical adjustment. This model puts out 1100 watts of power, which is higher than the average for the models we reviewed. It has a flow rate of 2.1 GPM, which is higher than 2.0 GPM average for the models we reviewed. This high power and high flow rate on this model means you will have to be much more vigilant about the water level on extended time cooking projects. 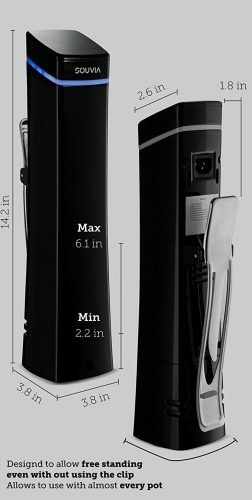 The high power and flow rate of this model means it will reach your set temperature a lot more quickly than most models. We liked a lot of the things about this model, but in the end we found there were too many other people with defective units for us to really feel comfortable recommending this model. For just slightly more money you can get our second highest rated model the Wancle Sous Vide SVC001 which is a much better value. We recommend the Wancle Sous Vide SVC001 instead. 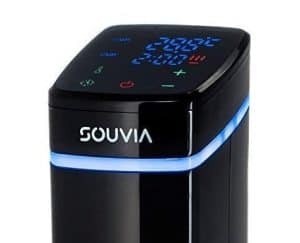 14.25" x 3.8" x 3.8" 11.1" x 14.8" x 4.5" 16" x 3.5" x 3.5"
The Magic Mill Souvia Sous Vide is a uniquely designed model that looks very attractive, however it has quality issues that we cant ignore and think most people should skip this model. Combining high quality with a space saving portable design the PolyScience 150 is a great vacuum sealer choice.